China Has Set Oct. 18 For Its Communist Party Congress. 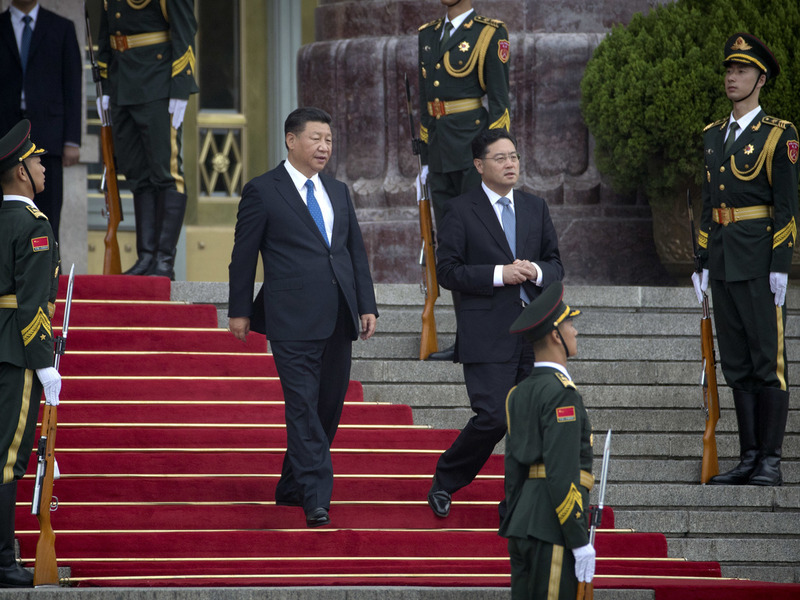 Here's What To Expect : Parallels There's little suspense about one outcome of the congress: President Xi Jinping is all but assured of another five-year term. He's maintained a grip on power to a degree not seen in China for decades. Chinese President Xi Jinping, center, arrives for a welcome ceremony for Tajikistan's President Emomali Rahmon in Beijing on Thursday. State media announced a key Chinese Communist Party meeting held once every five years will start on Oct. 18. There's not much suspense about one outcome of the congress: President Xi Jinping, 64, who is also the party boss and the head of China's military, is all but assured of a second five-year term. Xi has spent his first term consolidating his grip on power to a degree not seen in China for decades. He has packed the power structure with allies and protégés, and knocked out potential rivals through a wide-ranging anti-corruption drive. Last year, the party acclaimed Xi as the "core" of China's leadership, and officials since then have been especially busy pledging their fealty to him and studying his speeches and writings. Endless meetings have emphasized to the party rank and file the importance of "upholding the authority" of the party leadership and refraining from making "improper comments" about party policies. This month, for example, Xi's protégé Cai Qi, now party boss of Beijing, exhorted the capital's officials to venerate Xi's compiled speeches as "the most important book on your desk, your main reference work, and your source of mottoes." As previous party congresses have done for previous leaders, including Hu Jintao and Jiang Zemin, the 19th may formally enshrine "Xi Jinping Thought" in the party's charter. The general format of the conclave is similarly predictable. A couple thousand delegates will select a 200-member central committee, which will in turn produce a roughly 20-member politburo, above which is a standing committee of probably between five and nine men. (The chances of a female leader making it to this level appear slim). While the process appears to work from the bottom up, it is in fact controlled from the top down. Xi will likely run unopposed for the party boss job, his name being the only one on the ballot. What is less clear is what will happen to a number of informal, unwritten rules that have emerged to govern the transition of power at the top of the political structure. Founding Communist leader Mao Zedong ruled China until his death in 1976. Over the past couple of decades, the convention has been for leaders to serve fixed terms, and for members of the politburo standing committee to retire at age 68. But some of Xi's supporters argue that special times require a special leader and a special arrangement — including, perhaps, even a third term for Xi, stretching into 2027. Xi's right-hand man, 68-year-old Wang Qishan, who has led the government's anti-graft drive, may also stay on despite his age. A lot of important government work will remain on hold until after the congress, as the leadership is determined that nothing should distract from the big event. And while security throughout the country is sure to be very tight, they will hope that no forces beyond their control – natural disasters, international crises – intrude on the big meeting. The timing of the congress in mid-October should leave Xi enough time to get his domestic political act together — including unveiling his new leadership lineup, dispatching any challengers and outlining new policy directions for his second term — before President Trump's expected first visit to China later in the fall.